With Kodak in ruins, having filed for Chapter 11 bankruptcy in January, every tech company from the U.S. to Korea has been looking to scavenge what it can from Kodak's considerable portfolio of patents. On Wednesday, Kodak announced with a press release that an agreement had been reached, and that pretty much everyone will get a chance to kick Kodak while it's down and take its pick of the Rochester, N.Y. company's patents. Led by Intellectual Ventures and RPX Corp., the consortium of 12 companies reads like a who's-who of the tech world: Apple, Google, Facebook, Amazon, Research in Motion, Microsoft, Samsung, Adobe, Huawei, HTC, and former Kodak rivals Fujifilm and Shutterfly are all involved. The Fellowship will purchase about 1,100 patents from Kodak in a transaction that also includes settlement agreements in the ongoing patent suits between Kodak and numerous of the aforementioned companies. TechRadar has reached out to several of the companies involved, including Google, Apple, Amazon, Microsoft and Samsung, to discover whether they'd like to share any plans for Kodak's patents. So far Google, Microsoft and Samsung have responded, each declining to comment. Apple and Google had been vying for these same 1,100 patents in an auction over the summer, but they weren't exactly scrambling over one another to be the highest bidder. 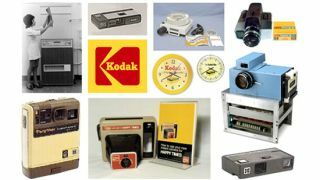 At the time Kodak believed that the patents were worth around $2.6 billion (UK£1.7 billion, AU$2.48 billion), but Apple and Google's offers ranged from $150 million to $250 million. The $525 million Kodak will receive if a Manhattan bankruptcy court approves the present deal is a step up from there, at least. As for Kodak, "This monetization of patents is another major milestone toward successful emergence [from bankruptcy]," Kodak Chief Executive Antonio M. Perez said in Wednesday's press release. "Our progress has accelerated over the past several weeks as we prepare to emerge as a strong, sustainable company," he continued. Kodak has dropped most of its businesses, ranging from scanners to souvenir photos, and will emerge with a newfound focus on commercial printing and packaging if all goes according to plan.